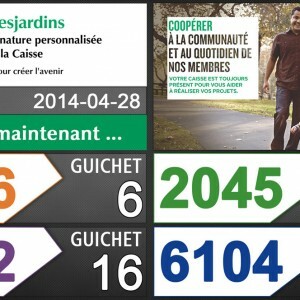 Mouvement Desjardins is the leading cooperative financial group in Canada and the fifth in the world, with assets exceeding $254 billion. 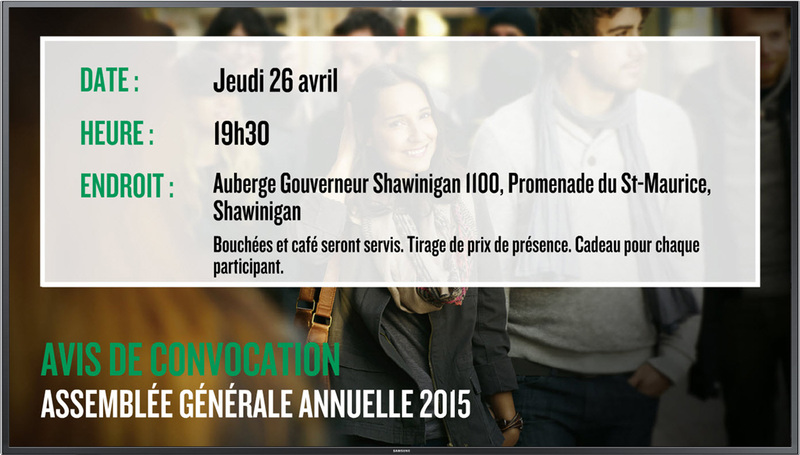 It ranks among the top 50 preferred employers in Canada as ranked by Aon Hewitt. 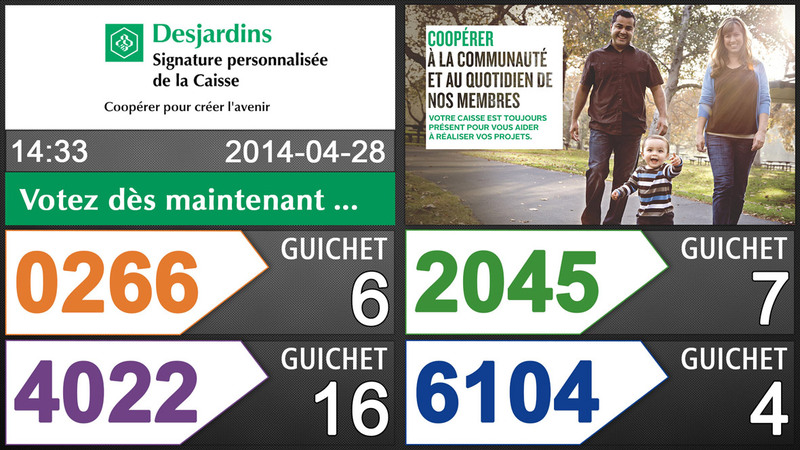 Caisses Desjardins has a wide range of communication needs to provide complete information about its line of products and services and to easily promote involvement in its community. It must be understood that these varied communication needs are linked to the specific community, clientele and local partners. These communication challenges centre on modernity, brand image promotion, local community development and effectiveness in linking everything together. 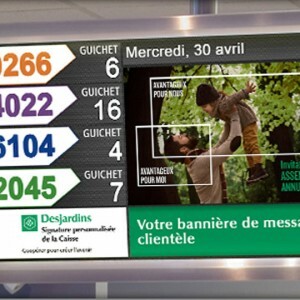 Solution: M’Pact developed a flexible, distinctive service for Desjardins that includes a logistics service ranging from screen positioning to supply of hardware, installation and on-site hardware system support. It also includes a host of content and graphic creation services that help branches attain all their distinct communication objectives with greater autonomy and effectiveness. 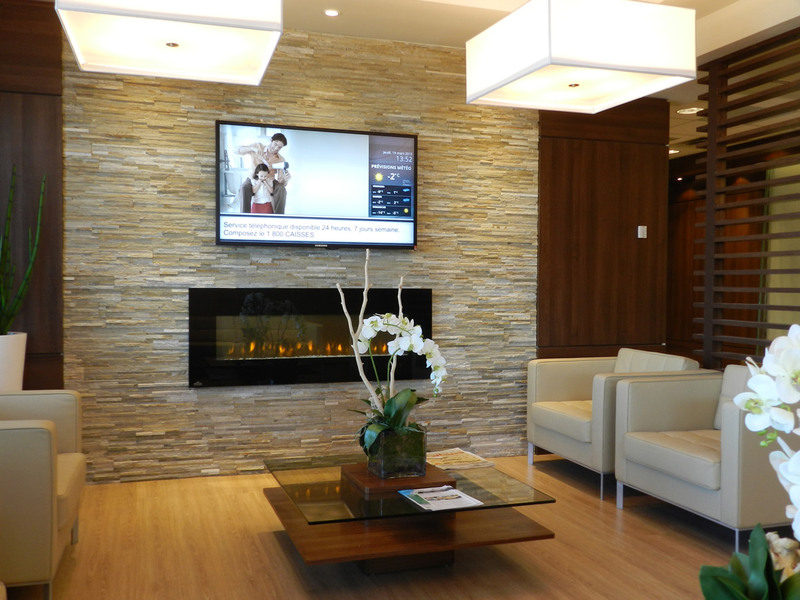 To provide a strong visual presence and create a modern, captivating space for members, M'Pact delivers wall or screen mosaic solutions. 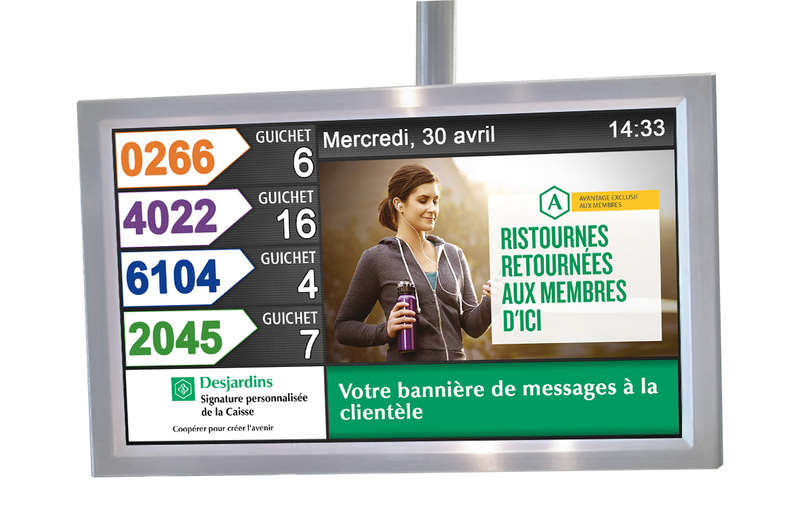 We also provide a digital signage solution on tablets with an interactive application and dynamic survey. 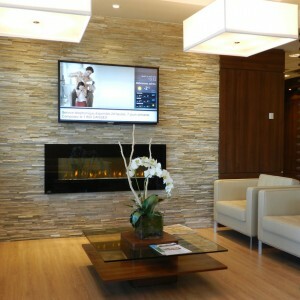 M’Pact can also design stainless steel protective cases and screen installations integrated into your interior design. 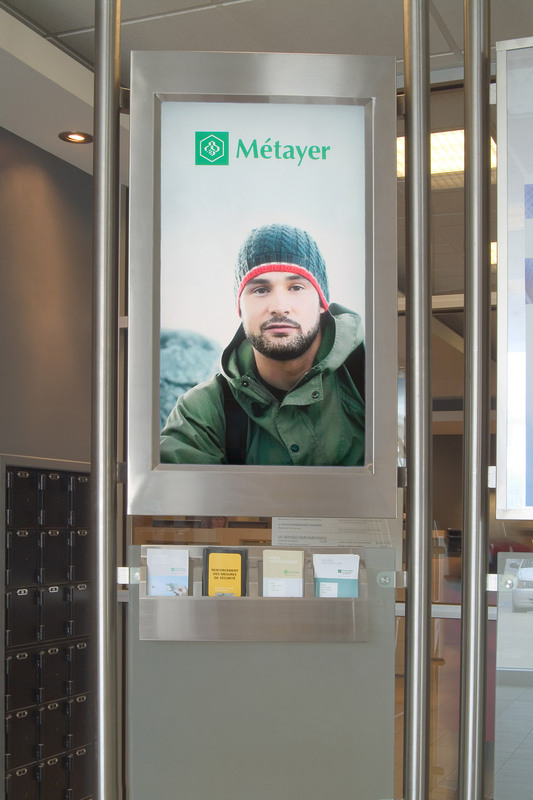 For waiting rooms, M'Pact offers a split screen solution that incorporates queue calling (QM), digital signage as well as entertainment content (new video or RSS and weather reports). 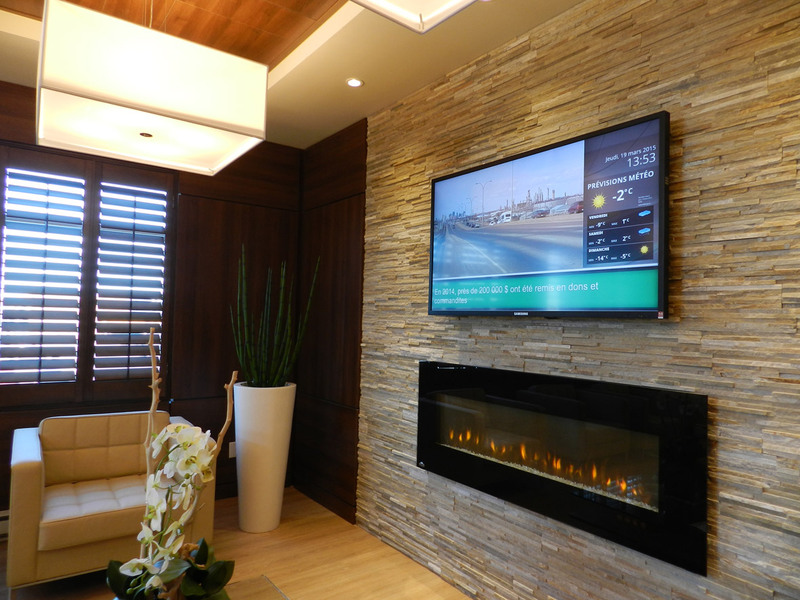 We can also provide a personalized ambient music station as well as call holding service. M'Pact guides the Caisses through the entire design, rollout and communication process and also offers the industry’s most complete and flexible service. 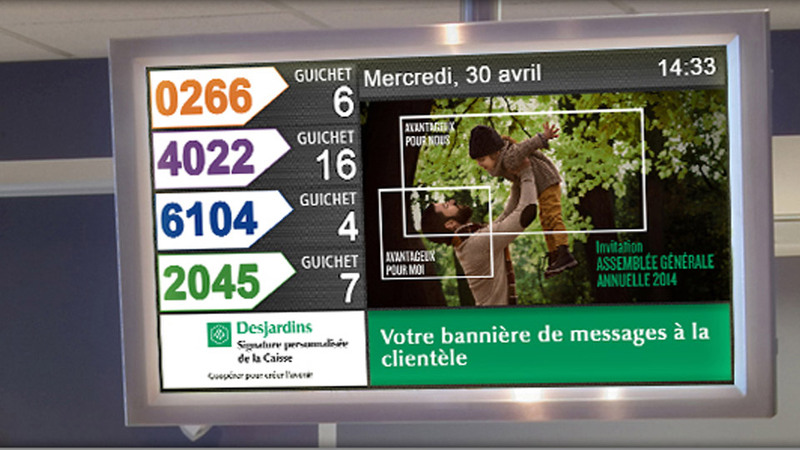 M'Pact technology now serves more than 200 screens in the Caisses Desjardins networks. 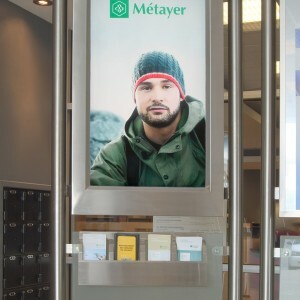 This success has continued to grow since 2006 because M’Pact provides branches with a broad range of services accredited by the federation and can adapt to each Caisse’s distinctive needs. 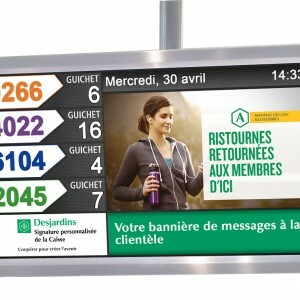 Our services let branches operate a low-cost personal digital signage network without limitations.